QUESTION: We have a large home that has webbing clothes moth traps. Recently, we found some of the traps with clothes moth, Indianmeal moths and a moth we don’t recognize. Are all these moths attracted to the same lure? ANSWER: The short answer is yes. Explaining why requires a longer answer. Indeed, you sent me a photo of a trap that shows webbing clothes moth (Tineola bisselliella) and Indianmeal moths (Plodia interpunctella, or IMM). The moth you don’t recognize is one of several closely related species that only can be determined by experts in the group. Whether it is European house moth or brown-dotted clothes moth is probably unimportant. 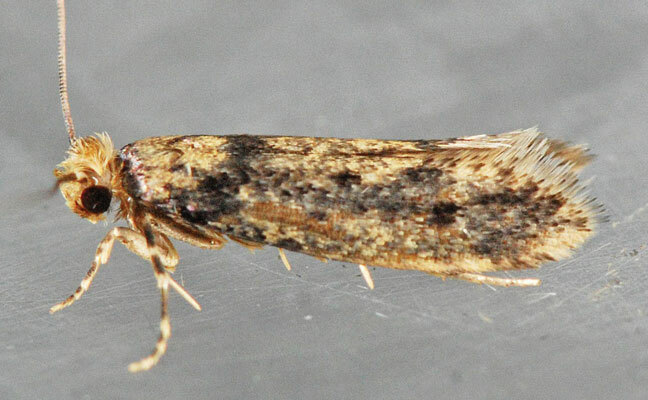 Niditinea orleansella and N. fuscella (also known as the poultry house moth by some) are both referred to by both common names depending on the reference you use. It’s very confusing. They showed up a few years ago in webbing clothes moth pheromone traps and are quite attracted them. Both Niditinea species feed primarily on feathers and bird droppings, and are said to be found in bird nests. Very few reports exist of them ever destroying clothing or the like. It may happen under some conditions, but they should be considered a curiosity and not a threat. Webbing clothes moths can be quite destructive, but they are relatively slow-growing. Females lay only about 45 eggs in their lifetime. If left undisturbed, they can build large populations and will destroy furs, woolens and other animal products. If susceptible items are regularly examined and cleaned, however, little destruction will occur. This is why most webbing clothes moth traps will show a moth or two — but never very many, unless a growing population is present. IMM are a different story entirely. Pheromone traps are very effective and can bring in IMM from great distances, but they are not attracted to webbing clothes moth pheromone. Why are they on your trap? Several explanations exist. After a day of handling pheromones, a person need only approach an infestation — such as one found in a store — and IMM will rise up to greet them. Those of us who have worked with these pheromones are quite familiar with the phenomenon of becoming a Pied Piper of sorts as we walk down the dog food aisle in a supermarket, for example. If you’re not careful, anything you touch can become attractive to moths, and that may be the most likely way to attract IMM to a webbing clothes moth trap. Often, traps are made in the same facility. It is also possible that some of the pheromone was inadvertently transferred to the webbing clothes moth lure during its manufacture. If this occurred, it doesn’t affect the ability of either lure, but it may be confusing if you didn’t expect it.